Even as economic and military walls have come down in the post-Cold War era, states have rapidly built new barriers to prevent a perceived invasion of 'undesirables.' Nowhere is this more dramatically evident than along the geographic fault lines dividing rich from poor countries: especially the southern border of the United States, and the southern and eastern borders of the European Union. This volume examines the practice, politics, and consequences of building these new walls in North America and Europe. At the same time, it challenges dominant accounts of globalization, in which state borders will be irrelevant to the human experience. In short, the volume brings borders back in to the study of international politics. “Borders in North America and Europe are being reasserted through ambitious and innovative state efforts to regulate the transnational movement of people. 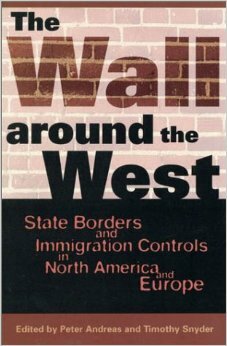 The purpose of this volume is to examine the practice, politics, and consequences of the construction of this ‘wall around the West.’ The trends we describe run counter to the conventional wisdom that borders are increasingly outmoded in an integrating world. As this volume demonstrates, along rich-poor divides globalization can be consistent with the reinforcement of state borders.